The moral conflict of Sir Thomas More, faced with his competing loyalties to his king, Henry VIII, and to his faith. At the start of shooting, few would have predicted that the screen adaptation of A Man For All Seasons would soon be scooping up the Oscars, garnering six in total, including awards for Best Actor ( Paul Scofield ), Best Director ( Fred Zinnemann ) and Best Adapted Screenplay ( Robert Bolt ). Columbia certainly did not anticipate such a conquest. The relatively low budget (£600,000), combined with location shooting thousands of miles away, meant that studio interference remained minimal and expectations modest. Yet the signs for success were always there. 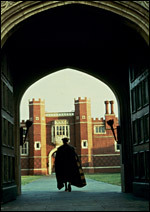 Fred Zinnemann may have seemed an unlikely candidate to direct a historical English drama, but the story of Sir Thomas More's conscience-driven defence of papal authority against the wishes of his King, Henry VIII, contained similar themes to Zinnemann 's best-known pictures, High Noon (US, 1952) and From Here To Eternity (US, 1953). The director drew powerful performances in portraying honest men standing up for their beliefs. In the case of A Man For All Seasons , he was aided by the choice of Bolt , the play's author, to write the film adaptation. Bolt had already written the screenplays for David Lean 's Dr Zhivago (US, 1965) and Lawrence of Arabia (1962), and proved himself more than capable of adapting his own work for the screen, deliberately cutting theatrical devices such as the character of the Common Man, despite Zinnemann 's initial protests. Scofield , having already played More with great success on the stage, created a memorable cinematic record of his career-best performance, while the rest of the impressive cast, including a glowering Orson Welles as Cardinal Wolsey and an appropriately unhinged Robert Shaw as Henry VIII, added to the sense of an exceptional production. The film admittedly condenses and simplifies historical events - the brusque editing pace at times compressing months and years into seconds of screen time - but plenty of space is given to developing nuances of character. It is true that the drama lies primarily in More's intelligent and often moving words, but Zinnemann saw this as properly drawing on the strengths of the play. Location shooting, authentic production design from John Box , interesting visual effects (notably Henry emerging out of the sun), and Ted Moore 's gorgeous cinematography, which captures the essence of the period English countryside, all add to the sense of a cinematic work that transcends the material's theatrical origins.